Photographs, caption and commentary by Jacqueline Banerjee, with many thanks to the Thomas Bewick Birthplace Museum and the National Trust, and to June Holmes, Archivist of the Natural History Society of Northumbria, Great North Museum: Hancock, Newcastle upon Tyne. 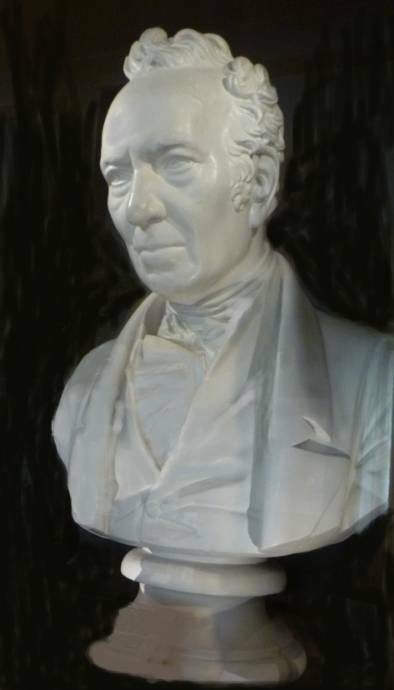 The background of the photographs of the bust and Bewick's face has been digitally removed by the author. Click on the thumbnails for larger pictures. Baily shows the veins on Bewick's forehead and other small irregularities, and, from what we know of Bewick, the expression too is exactly right — penetrating, firm and kindly. Two details. Left: Bewick's face. Right: His neckcloth and ruffled shirt front. 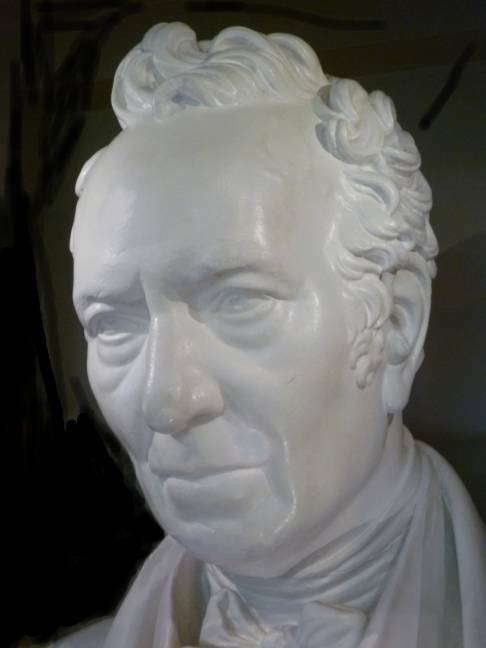 The original marble bust still belongs to the Literary and Philosophical Society, and is currently on display in their Library in Newcastle, while this copy is now on loan to Cherryburn from the collections of The Natural History Society of Northumbria, Great North Museum: Hancock. Even though it is a copy, and in a display case along with other materials, it still makes an impact. The ruffled shirt is particularly eye-catching: Bewick had clearly made the right choice of attire. The two famous practitioners of different arts evidently made friends: when Bewick went to London in the summer of 1828, to see Longman about selling off his books, Baily arranged a trip to Hampstead and Regent's Park. But Bewick was too tired to visit the zoo, which he would normally have loved (see Uglow 481). He died that winter, and was buried in Ovingham churchyard, Northumbria, with his wife Isabella, near other family members. Bewick's minutely detailed woodcuts were extremely popular in the nineteenth century: Jane Eyre (famously) is reading the introductory pages of his History of British Birds at the beginning of Jane Eyre: "Each picture told a story; mysterious often to my undeveloped understanding and imperfect feeling, yet ever profoundly interesting.... With Bewick on my knee I was then happy" (10-11). He was also much praised by Ruskin, who had an annotated copy of the same book (see Uglow 439n), and wrote, "the execution of the plumage in Bewick's birds is the most masterly thing ever yet done in wood-cutting" (136). It is not hard to see the influence of Bewick's tiny, meticulously accurate and atmospheric compositions on Ruskin's fine drawings of natural objects, or indeed on Pre-Raphaelitism generally. 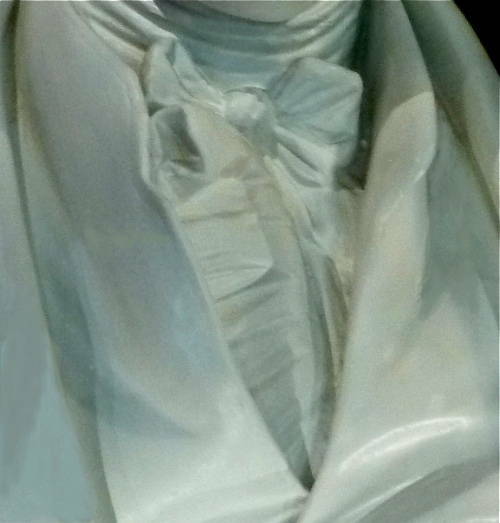 June Holmes adds that more can be learnt about the bust and other Bewick portraits in a published paper, "The Many Faces of Bewick: An Illustrated Catalogue of the Portraiture of Thomas Bewick...," in Transactions of the Natural History Society of Northumbria, Vol. 65, Part 3. Brontë, Charlotte. Jane Eyre. London: Penguin Popular Classics, 1994. Ruskin, John. Art; A Ruskin Anthology, ed. W. M. Sloane Kennedy. New York: John B. Alden, 1886. Internet Archive. Web. 27 June 2011. Uglow, Jenny. Nature's Engraver: A Life of Thomas Bewick. London: Faber, 2006.